condensers, the plant’s four louvered-panel stamping lines—one of which just went online in April of this year—must produce 16,000 panels per day. Panels are of 0.029-in.-thick galvanized mild steel from coil stock 27 to 37 in. wide. Manufacturers serving the heating-ventilating and air-conditioning (HVAC) industry—OEMs and suppliers alike—consume tremendous amounts of sheetmetal, and so it follows that these companies often lead the in developing and implementing state-of-the-art sheetmetal forming and fabricating technology. Throughout the industry, manufacturers say that sheetmetal forming is a core process that triggers heavy investments in technology year after year to keep up with demand for new models of air conditioners, heat pumps, furnaces and other HVAC equipment. To track this trend first-hand, we visited the Tyler, TX, plant of Trane, which manufactures residential central air conditioners and heat pumps. There, we interviewed two engineers in the firm’s advanced manufacturing engineering (AME) group, Randy Peterson and Jay Blalock, and also spied a newly commissioned robot-automated tandem press line. Blalock and Peterson are two of 12 AME-group engineers that take on manufacturing-engineering projects company-wide, some 15 percent focusing on sheetmetal forming. This new louvered-panel line began production in April, and features a 400-ton Minster mechanical blanking and louvering press, three Macrodyne secondary hydraulic presses, and four Motoman material-handling robots. The cell turns out completed, stacked panels at a cycle time of 8 sec. or less. View a video of the line in operation at metalformingmagazine.com/multimedia. Several metalforming lines at the plant support an array of assembly lines that work from an electronic kanban system. Each day a master scheduler produces daily batch orders for the following day’s output, and the manufacturing plant, including the pressroom, runs just-in-time to support the assembly schedule. “We produce multiple models of multiple product lines each and every day,” says Blalock. Batch size can vary from two to 30 assemblies, or more. While supporting production of so many model variations and sizes—300 or more model variations, says Blalock —requires a truly custom and flexible fabrication and assembly plan, one area of the plant serves as a real backbone to production, and also as a possible bottleneck. That’s the set of stamping lines turning out louvered panels that construct the outer case for each and every unit the plant assembles. To produce some 4000 air-conditioner condensers a day, the plant’s four louvered-panel stamping lines—one of which just went online in April of this year —must produce 16,000 panels per day. Early in 2006, Blalock and his team realized that its three existing louvered-panel lines were working overtime to keep up with growing demand, and that a fourth line was necessary to meet existing and future production demands and avoid a bottleneck. To engineer and develop the line, it turned to its long-time pressroom-automation vendor Atlas Technologies, Fenton, MI, which took Blalock’s plan to utilize robots—to minimize labor content—and ran with it. Stacking the completed panels at the end of the line was a major issue, as the radius formed into each blank leads to leaning stacks, in two planes. The specification for the press cell called for the ability to stack the panels 75 high; end-of-line pallets (right) hold two stacks each and are removed from the cell via fork truck. Atlas programmed the end-of-line stacking robot (above) to delicately place the panels on top of the stack, ensuring that the louvers nest together to create a very stable stack. 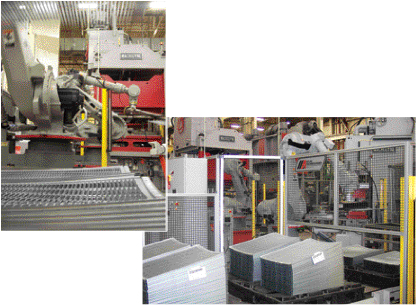 The new Tyler louvered-panel line comprises a coil-fed main forming press that blanks the panels and cuts and forms the louvers, then hands the panels off to a series of material-handling robots that transfer the panels to a lineup of secondary presses. For the main blanking and louvering press, the plant repurposed a Minster 400-ton mechanical press fed by a reconditioned Rowe coil line. Press and coil line had been sitting idle, so refurbishing and repurposing them with new, updated controls made sound economic sense. For secondary presses, Trane and Atlas turned to Macrodyne (Concord, Ontario, Canada) for hydraulic presses —two 110-ton four-post machines and a 90-ton gap-frame model. 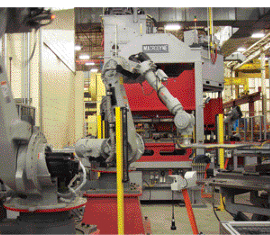 Four Motoman (West Carrolton, OH) robots tie it all together. The line turns out 36 different part numbers—louvered panels of 0.029-in.-thick galvanized mild steel from coil stock 27 to 37 in. wide (the feed line can handle coils to 52 in. wide). Coil stock feeds into the Minster, which forms one bank of louvers per stroke. Panels take from three to seven louver banks, oriented either horizontally or diagonally across the panel. The press operator can change tooling on the press in as little as 5 min. 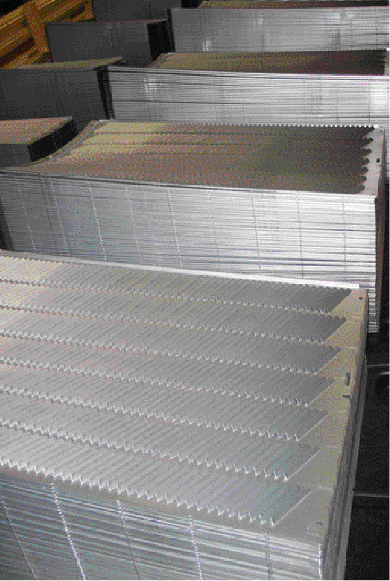 to obtain the required louver design. And, the firm ordered backup tooling for every louver die, since zinc dust tends to build up on the die, requiring the tools to head to the toolroom for maintenance after every 25,000 hits. Following the louvering process, the first of the four Motoman robots reaches into the press to grasp and index the louvered blank to the first of the three hydraulic secondary presses. The first press punches and notches, the second press performs a flanging operation, and the third press forms a 55-in. radius to the blanks. Three robots move blanks in and out of the press beds in sync with ram motion; the fourth robot serves as an end-of-line stacker. Robots wield magnetic end-of-arm tooling, since the louvers preclude the use of suction cups. Each set of tools includes proximity switches looking for part presence. Cycle time, originally optimized to a specified 9 sec. per finished panel, has been sliced by Atlas to 7.6 to 8 sec, depending on part size. To get there, Atlas fine-tuned the robot-motion profiles so that the robots follow each other in and out of the notching-piercing press more closely than originally programmed. One robot loads the die as the next robot unloads, rather than requiring the loading robot to wait until the unloading robot has entirely cleared the press bed. Fractions of a second also were carved from the cycle when cell-layout simulation performed by Motoman refined robot position so that the robots would operate more in their “sweet spots” as much as possible, and move at a higher rate of speed. Along with upgrading the Minster press and Rowe feed line with new controls, Atlas also integrated the new controls with an Allen Bradley supervisory control, which serves as the director of the complete and complex sequence of operations required to produce the louvered panels. Trane had the tooling for each of the secondary presses designed to accommodate every one of the 36 panel variations, a considerable challenge for the project, says Peterson. Servo motors in the tools adjust tool width and height based on part specifications, and locator pins alter the tools as features need to be gagged in and out. “These features make the tooling complicated,” adds Peterson, “but one of the directives for this line was quick changeover among panel models. All tooling adjustments to the hydraulic secondary presses, and to the louver die, occur automatically when the operator enters the part number into the cell controller, to call up the required system recipe. And the robots were all programmed point to point for each panel layout, without the use of vision. “Stacking the completed panels at the end of the line was a major issue,” says Peterson, pointing out that the radius formed into each blank leads to leaning stacks, in two planes. The specification for the press cell called for the ability to stack the panels 75 high; end-of-line pallets hold two stacks each and are removed from the cell via fork truck. However, the plant’s other louvered-panel lines only stack 60 to 65 high. The biggest challenge with those older lines is that they employ gantry-style stackers that drop the finished panels on top of each other. As each panel falls on top of the stack, the stack becomes less and less stable. With the new robotic line, Atlas was able to program the stacking robot to delicately place the panels on top of the stack, ensuring that the louvers nest together. This creates a very stable stack. To accomplish this task, it had to program a unique set of end-position coordinates for the robot for each and every sheet on the stack, to adapt the motion profile for the growing stack. This proved to be quite a time-consuming programming task, but well worth it as the difference between two stacks of 75 compared to two stacks of 60 means significantly fewer fork-truck runs. Not to be overlooked is the comprehensive safety plan included with the cell. The entire line is guarded with fencing and a redundant light-curtain setup provided by Pilz, Canton, MI. Slide locks on the hydraulic presses automatically lock the slides when an access gate in the fence opens; opening a gate also triggers the robots to enter an inching mode. “Customers find press-tending robots easy and fast to implement,” Demonet adds, “as evidenced by the Trane application (described in the accompanying article). The beauty of that project is that it employs all standard equipment that Trane can easily redeploy down the line, should it need to. Demonet expects HVAC manufacturers to continue investing to automate their pressrooms, primarily as they introduce new products into the market. “Long term, we’re optimistic as our quoting activity is very high right now and has been for some time,” he says. “Most notably, we’re seeing growing interest in more flexible types of automation—robots rather than dedicated, hard design-for-a-purpose automation. Robots from a cost standpoint make sense today, and are proven to be robust and effective machines that run dependably in the pressroom environment. In terms of the types of automation being installed at HVAC companies, there is no one formula for success, continues Demonet. “We’ve installed everything from tandem lines with high-speed pick-and-place automation, to stand-alone transfer presses, to complete production cells with either dedicated automation equipment or more flexible robotic automation. However, Demonet has noted significant investments in pressroom-optimization projects from the second tier of appliance OEMs, those companies that provide the more high-end specialty appliances such as Wolf and Viking. “We saw a lot of high-speed automated lines go into these plants,” he says. For a snapshot of the pressroom-automation picture in these industries, we spoke with Ron Demonet, vice president of sales and marketing for Atlas Technologies, Fenton, MI, a provider of turnkey stamping and fabricating systems, robotic integration, die-change and automatic storage and retrieval equipment, stacking and destacking systems and in-press transfer systems. While Demonet notes a slowdown in capital investment from the larger appliance OEMs (Whirlpool, Electrolux, etc. ), due to ongoing consolidation in the industry, much investment had been made by these companies earlier in the decade in pressroom automation, primarily related to transfer-press work. With manufacturers of appliances and HVAC systems devouring sheetmetal in huge quantities, they remain committed to developing sheetmetal forming and fabricating as core competencies. Most have recently invested heavily in automating their pressrooms and continue to do so, adding primarily flexible automation that allows just-in-time supply of small to medium-sized lots to quick-changeover assembly lines. See also: Atlas Technologies Inc., Macrodyne Technologies, Inc., Yaskawa America, Inc., Pilz Automation Safety L.P.